Group Lotus says its Formula 1 ambitions extend beyond being a title sponsor and shareholder of the re-branded Lotus Renault team - as it hints about taking full control of the outfit in the next few years. The Malaysian-owned car maker has taken a significant stake in Lotus Renault, with the other half of the company remaining under the control of Genii Capital. And although nothing has been decided yet about future ownership plans, Lotus CEO Dany Bahar has hinted about a full-on takeover in the next few years. "Our way of doing things means that at the end of the project we would like to control it ourselves," he told this week's AUTOSPORT in an exclusive interview. "It's the same route - it starts somewhere and then you slowly take control. We would not be in for the long-term just to be a sponsor on the team." Gerard Lopez, the head of Genii Capital which brought a majority shareholding in the team at the end of last year, said that his company remained committed to staying involved for now. "There is no real timescale to it," he said. "There is the opportunity for the partnership to evolve in the future. To discuss, even between ourselves, what the world is going to look like in five years is really difficult. "I wouldn't be surprised if there were changes in the future but at this stage things are good the way they are. We are committed long-term." Lotus's ambitions plans in racing and on the road car front have prompted questions about whether or not the company has the finances in place to see its plans turned into reality. 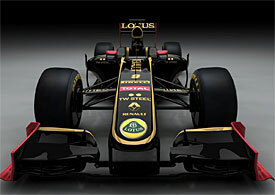 Bahar is adamant, however, that the money is there for Lotus to succeed. "We would not commit without backing from shareholders, banks and investors," he said. "If we didn't it would be foolish to come up with ambitious plans like this."